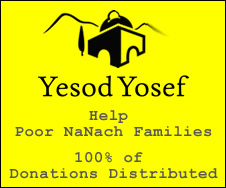 B”H Yesod Yosef distributed Shabbos assistance to 8 poor families. Two loans were granted through the Yesod Yosef Loan Gemach. Once a pauper possessing only a silver coin worth half a Ma’ah (currency used at the time) passed in front ofRebbe Yitzchak. He requested that Rebbe Yitzchak contribute and supplement this amount, allowing his family to survive. Rebbe Yitzchak replied that all he had was an additional half a Ma’ah and even were he to give that, it would not be sufficient for the family’s survival. After the pauper responded; that combined with his own half a Ma’ah he will be able to manage, Rebbe Yitzchak pulled out his coin and handed it to him.